Belgium has its share of regional classics: waffles, meatballs in rabbit sauce, carbonnade flamande (Flemish beef stew), and the list goes on. I indulged in a selection of local eats when I visited Brussels in 2016, but moules-frites is the one dish that stands out so clearly in my memory. 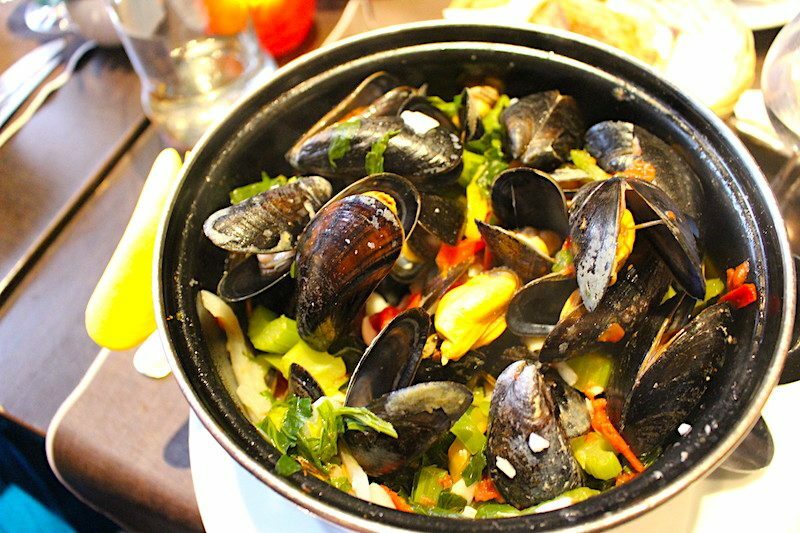 I ate a giant portion of mussels at Le Chou de Bruxelles in the Ixelles neighborhood. 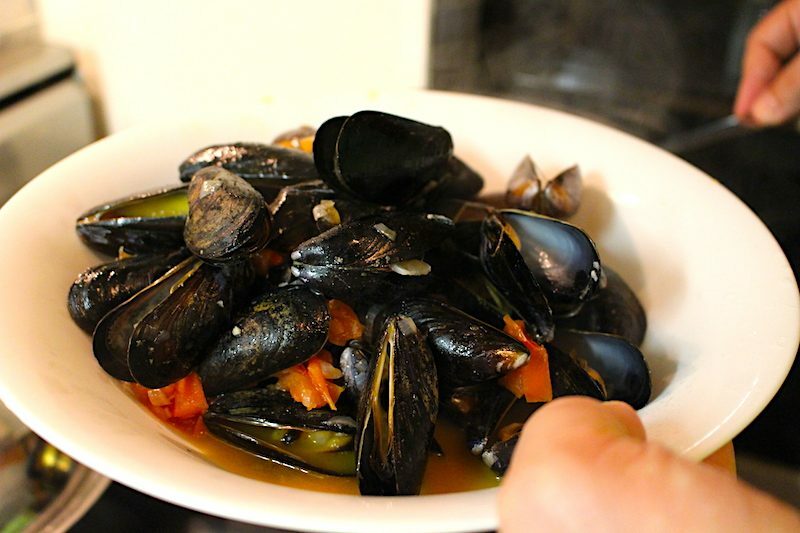 Plump, succulent mussels flavored with shallots, celery, tomato, and white wine. With frites on the side, these make a delicious and satisfying meal and were my favorite eats during my time in Belgium. What makes mussels and fries so craveable? There’s something about the brininess of the mussels and the crispiness of the potatoes that complement each other, creating a wonderfully balanced dish. Moules-frites are a match made in food heaven if you ask me. While mussels aren’t always entirely satisfying on their own, when you add fries into the mix, suddenly, a hearty meal is waiting to be devoured. Most often, the broth is perfect for sipping and dipping, so a crusty chunk of French bread is worth those extra carbs. Are you hungry yet? 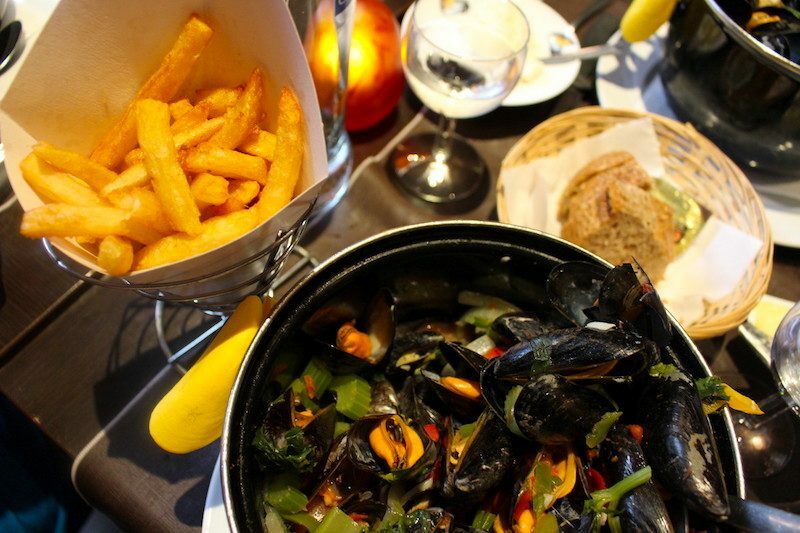 If hopping a plane to Belgium isn’t on your agenda at the moment, you can cook moules-frites yourself, and don’t need to be a seasoned chef to do it. Here’s an easy recipe to try at home. The most important thing is to watch the pot and not walk away. Do not overcook! When the mussels open, turn off the heat immediately. Bear in mind that the lid will contain the heat, and the mussels will continue to steam even after the flame is out. Rinse mussels well. Discard any that are partially open and will not close with a pinch. This means they are dead and you do not want them. In a large stockpot, heat the butter and olive oil over medium heat. Add the shallots and cook for about 4-5 minutes, then add garlic and cook for 2-3 more minutes. The shallots should be translucent. Add the tomatoes, fresh herbs, salt, optional pepper, and cook for 3-5 minutes. Add the white wine, and turn heat to high, bringing mixture to a boil. Add mussels, reduce heat to medium and stir. Cover the pot and cook for about 5-6 minutes or until mussels have opened (throw away any unopened mussels). Shake the pot a few times to be sure mussels do not stick. Spoon mussels and broth into a large bowl (remove what’s left of cilantro springs), and top with chopped herbs. Serve with fries ( I recommend frozen Alexia house-cut fries with sea salt, just bake in the oven) and a French baguette (or other crusty bread of choice). Cooking mussels isn’t as romantic as jetting off to Belgium, but until you can book that trip, indulge in classic moules-frites at home. Also, if you’re planning a trip to Belgium, I recommend Liege as well as Brussels. I have not been to Bruges, but I would love to go! Stay connected and get the latest by email! Any redistribution or reproduction of part or all of the contents in any form is prohibited without express permission of Tracy Kaler.